Founder of the Ahom kingdom in 1228 Chaolung Sukaphaa (Chao means Lord and Lung means Great), also known as Siu-Ka-Pha was the was the first Ahom king in medieval Assam. A Tai prince originally from Mong Mao, the kingdom he established in 1228 existed for nearly six hundred years and in the process unified the various tribal and non-tribal peoples of the region that left a deep impact on the region. In reverence to his position in Assam's history the honorific Chaolung is generally associated with his name. Sukaphaa was born to Chao Chang-Nyeu (alias Phu-Chang-Khang) and Nang-Mong Blak-Kham-Sen in the Tai state of Mong Mao, close to present-day Ruili in Yunan, China. Chao Chang Nyeu was a prince from Mong-Ri Mong-Ram, who had traveled to Mong Mao possibly on an expedition. Mong Mao was then ruled by Chao Tai Pung. Chao Chang Nyeu was befriended by Pao Meo Pung, the son of the ruler, who gave his sister Blak Kham Sen in marriage. Sukaphaa was born of this union not later than 1189 and was brought up by his maternal grandparents. Pao Meo Pung, who eventually ruled Mong Mao, had no male heir and Sukaphaa, his nephew, was nominated to succeed him. However, a son born late to Pao Meo Pung's queen ended Sukaphaa's claim to the throne of Mong Mao. According to Ahom tradition, Sukaphaa was a descendant of the god Khunlung, who had come down from the heavens and had ruled Mong-Ri-Mong-Ram. During the reign of Suhungmung, which saw the composition of the first Assamese chronicles and increased Hindu influence, Sukaphaa's origin was traced to the union of god Indra (identified with Khunlung) and Syama (a low-caste woman), and he was declared the progenitor of the Indravamsa kshatriyas, a lineage created for the Ahoms by the Hindu Brahmins. Siu-ka-pha did not go back to his father's kingdom rather decided to march towards west to rule a western state called Mong Pa-kam now identified with the eastern part of Kamarupa. Sukapha's followers included several nobles (thao-mong),a number of officers of various ranks, nine thousand men, woman and children. After a westward march for thirteen years and staying at several places for periods ranging from one to three years, they arrived at the Patkai in 1228 A.D. Posting a governor at the Khamjang valley, their first territorial unit, situated on the shore of the Nongjang lake, Sukapha and the rest of his party at first followed the Namrup, then the Buri Dihing (Nam-jin), thereafter the Brahmaputra, and the Dikhow before finally arriving at Charaideo, which became his permanent capital. On the way,he also organized several other territorial units along the bank of these rivers. In this way a small kingdom bounded by Patkai, the Buri Dihing, the Brahmaputra, the Dikhow and the Naga hills was founded in Upper Assam over which Sukapha ruled till his death in 1268 A.D. This territory was peopled chiefly by the Morans and the Borahis, and a few villages of the Chutiyas and the Kacharis evidently of Bodo origin; Nagas were also included in the hilly region of the Patkai. Sukapha won over the chiefs of Morans and the Borahis, and even encouraged intermarriage with them,and appointed some of them in various capacities in the royal household. Before arriving at Charaideo, he moved from place to place searching for the right capital, leaving behind his representative at each stage to rule the colonized land. Then he went up the Burhidihing river and established a province at Lakhen Telsa. Then he came back down the river and established his rule at Tipam. In 1236 he moved to Mungklang (Abhoipur), and in 1240 down the Brahmaputra to Habung (Dhemaji). In 1244 he went further down to Ligirigaon (Song-Tak), a few miles from present-day Nazira, and in 1246 to Simaluguri (Tun Nyeu), a place downstream from the present-day Simaluguri. Sukaphaa then remained in Demow for six years. Finally in 1253 he built himself his capital city at Charaideo near present-day Sibsagar town. The capital of the Ahom kingdom changed many times after this, but Charaideo remained the symbolic center of Ahom rule. With the help of local recruits, he established three large farms for sali rice cultivation, called Barakhowakhat, Engerakhat and Gachikalakhat. In 1268 Sukaphaa died. At the time of his death, his kingdom was bounded by the Brahmaputra river in the west, the Burhidihing river in the north, the Dikhow river in the south and the Naga hills in the east. 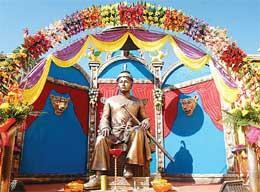 Suteuphaa succeeded his father Sukaphaa, who laid the foundation of Ahom kingdom in Assam. His reign was characterized by the expansion of his father's kingdom. He also had conflicts with the Shans or Naras of Mungkang, a Shan kingdom in Upper Burma. Sukapha Samannay Kshetra : Sukapha Samannay Kshetra was constructed in the memory of Sukapha, the first Ahom king of Assam. The site is located at Mohbandha near Dergaon and Jorhat. An excavation project is being operated at the site, to find any remains of the Ahom kingdom. Since 1996 December 2 has been celebrated in Assam as the Sukaphaa Divas, or Asom Divas (Assam Day), to commemorate the advent of the first king of the Ahom kingdom in Assam after his journey over the Patkai Hills.